For a long long time I've been saving up for a new car, and over the last several months I've been testing out numerous cars to see which one suites me. Now, for the first time in my life, I've bought a brand new, off the factory floor, car. After hunting around for ages looking for the perfect car I always wanted, I found it. It's a beauty as well. 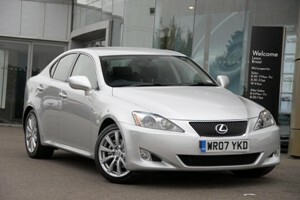 It's a Lexus IS250 SE-L Automatic with Multimedia. Which means it's not cheap, but has more gadgets than 007, and believe me, some of them really seem to come straight from a Bond movie (which would explain seeing MI5 on the TV show, "Spooks" driving them around). So I drove a couple of really sporty convertables, and hard-tops, and figured that I would be thrilled for about a week, then would have got bored of having one and wonder why my arse hurts so much on a long journey (which I tend to do by car). I wasn't going to Lexus at the start because I simply considered them as VERY expensive luxury cars, and when I went there, they were just that. However, the expense didn't compare to the german equivalents, which costs 10k more, but had more steam out of their 2.5 litre engines. That being said, the ride wasn't as good (taking into account longer journeys and not darting around a race course every week), and they didn't have anything like the gadgets that the Lexus does, and that's my weakness. Weirdly, you might think, I had one of my top runners as the Ford Mondeo ( the new model of course), which had some good gadgets (sucker), and I have to say the ride was pretty darn good... I really wasn't expecting it to be as good as it was.. and they are cheap too (comparing to the rest of the market). However, everytime I was condering the car, the same problem kept arrising, and its was a big'un.. "It's a Ford".. "It's just a Ford", "why the hell would I buy a Ford?!".. those boring old corporate cars that no one other than pink shirt wearing office monkeys would want to own. The moment I stepped into the Lexus IS250 I was in "wow" mode. The quality spoke volumes... but then the drive... was perfect. I first tested the IS250 Sport manual, but I didn't like the gear box. Others have moaned about the gear stick, but I actually didn't mind that, but the clutch was really sensitive, one of those "it's either coasting or engaged and you aren't allowed anything inbetween". 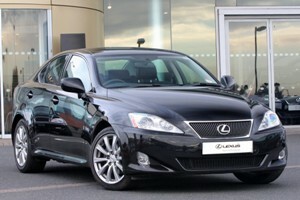 it was probably that car as no two cars are quite the same, but others have had problems with the manual lexus as well. Taking that around a track would have been sweet (probaly better in a BMW, but none-the-less would have been fun).. However I want to use on the motorway or going 8 mph around Bristol because of the crappy traffic, so decided I wanted more gizmos and a softer ride. Whats more I also decided for the first time ever to own an automatic. The other reason for the automatic was also because the emmissions were lower (never quite worked that out as the engine is identical to the manual), and therefore the Tax is much less, and secondly, because cars are now smarter than humans (watch a LS 450 park itself! ), the fuel economy is better too.